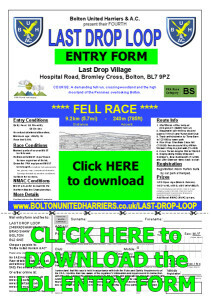 The Last Drop Loop is a Fell Race based from the Last Drop Village off Hospital Road in Bolton (BL7 9PZ). 2013 saw its first staging as a BS-graded course, according the Fell Race Association guidelines. Crossing the high moorland of the Pennines overlooking north Bolton, it covers 9.2km (5.7 miles) with 240m (785ft) of vertical ascent. The next event is on Saturday, TBCth May 201x starting at 1pm prompt. *Please note that an additional processing fee may be charged, but no stamps and other postage costs are incurred. – Minimum age for entry is strictly 18. – Appropriate clothing and equipment is essential. Equipment deemed essential under FRA rules MUST be brought to the race by competitors, though the necessity for its carriage during the race may be relaxed by the race organiser dependent on weather conditions. Appropriate footwear, full waterproofs, hat, gloves, map, compass and whistle. – Marked parts of course MUST be followed. Though the LDL course will feature partial marking, competitors must be aware that FRA races are organised on the premise that competitors have the necessary skills to cope with the navigational problems which may occur, whatever the weather. – The philosophy of fell running is that it is the competitor who is primarily responsible for their own safety whilst competing. – Retirements MUST report to the race organiser at the finish, even if a course marshal is informed. These documents will all be on display and available to read at Registration. By entering the race, the runner acknowledges that they have read, accepted and complied with the Conditions within the FRA documents (for runners), official entry form and LDL webpage. Race HQ and registration is in the Turton Suite conference centre, just off from the helipad on the hotel’s rear car park. 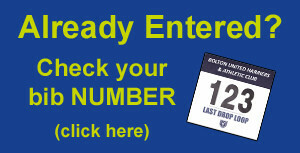 Pre-entrants can pick up race numbers here also. The race start is immediately next to the helipad. If deemed necessary, an equipment check to the level specified by the Race Organiser (based on anticipated weather) will be carried out here using a holding pen. Failure to have the minimum required kit at this point will not be excused – please help us and avoid disappointment by bringing it! Car-parking may be limited if arriving after 11.30am. Alternative parking may be on the residential streets off Hospital Road, but please be courteous for residential access or available at the ‘Ousel Nest’ car park of the Upper Jumbles (BL7 9AJ) which requires a 700m walk to the HQ. We recommend at least 30 minutes’ grace to get from your parking spot to Race HQ to register/pick up your number and be prepared for a potential kit check. From 2016, the LDL has incorporated the Northern Masters Championships (previously Northern Veterans). Please note that entrants with a valid NMAC registration MUST pre-enter to count towards the NMAC standings. Prizes are available for the first 3 Open Age finishers (male and female), and 1st two o/40, o/50 & o/60 Veterans (male and female). Please note that there is one individual prize per person, with the race being in age category, except the main race. The prize list may be expanded based on pre-entries. Additional prizes may be available in the Northern Masters championships. These will be presented at Race HQ immediately after the race. The route starts at the helipad (Ordnance Survey map E287, Grid Reference 722141) with a parade lap clockwise around the field. It then heads north out of the field and skirts by the disused quarry (719147) and Turton Golf Club. A track anti-clockwise by Torra Barn is taken to 727156 by the lower path, before a steep rise west up Cheetham Close hill (719155). From the summit, descend north by Witton Weavers Way to a wall junction by pylons (714168), then a southwest traverse of Turton Heights ends at 706163. An immediate dogleg along Rotary Way past Horridge’s Farm, New Butterworth Farm (714150) and Little Stanrose Farm leads back to the finish at the helipad (same as the starting point) via a diagonal across the parade lap field. Click the Route Map for a larger version. 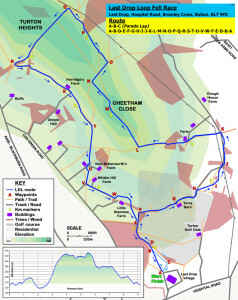 Alternatively, click HERE to download the current LDL Route Map in PDF format. A navigation route map will be sent via email to all pre-entrants and will be availlable on the day. All runners are reminded that the course is run ‘point-to-point’ along a defined route and any deviation will be investigated and likely result in disqualification. View of western part of LDL (in blue) from upper Astley Bridge, with Turton Heights (left), Cheetham Close (centre) and Last Drop Village (right). View of eastern part of LDL (in blue) from lower Affetside, with Cheetham Close (centre), Turton Heights (right) and Winter Hill (back left). All the entries currently received and processed for the upcoming Last Drop Loop Fell Race can be viewed by clicking THIS link or the image to the left. There is some important information to read as issued by the FRA. Please read and scroll down through this extra information, including the local weather forecast and final reminders, that is listed here – it is for your benefit! BUH&AC hope you have a safe and enjoyable race. 2019: Hopefully…coming soon…after the race!!! 2017: The race was not held this year. The race was held to coincide with the Bromley Cross Fayre for the first two years, but this association ceased as the Fayre encountered organisational issues. To contact the Organisers of the Last Drop Loop, please use the CONTACT US page (click HERE). Though this takes you to the Bolton 10K site, the relevant people can be informed. BUH&AC would also like to thank Rob Short and the Team at Decathlon Bolton for kindly supporting the LDL with the printing of all runners’ numbers and sponsoring the main race and age category prizes. Decathlon opened its store on Trinity Retail Park in 2011 and, by catering for over 70 sports with a wide range of equipment and clothing, certainly lives up to its tagline of “Sport For All, All For Sport”. Thanks also go to Sandra Ogden and the Team at Greenhalgh’s for providing the post-race refuelling treat for runners. Over 50 years, the craft bakery, now based in Lostock, has grown as a family business to supply the demand from Bolton and the wider North West area with its high quality breads, cakes, savouries, sweets and sandwiches. Many thanks to Emma Kay and the Team from Sales & Events for kindly providing the use of the conference room in the Rivington Suite for Registration – it’s always nice to have somewhere covered in case of inclement weather! The Mercure Last Drop Village Hotel & Spa is a traditional hotel set in a converted 18th century farmhouse with cobbled streets and quaint village shops. Why not visit the Tea Shop for a post-race beverage and cake, or perhaps even the Courtyard Bar for a hot meal and something stronger?